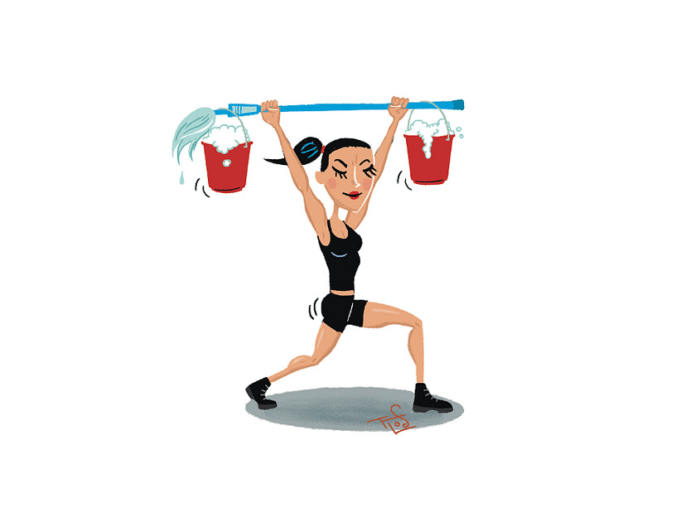 Cleaning is a workout, so here’s how to make it work for you! Sometimes I feel like a pack mule loaded to the gills with laundry and cleaning supplies. When all hope feels lost and I feel like my legs might give way (ok maybe I exaggerate but you get the idea) I feel excitement to think that some people pay good money for this type of pain! Not every property you clean will have stairs but many do. I am constantly walking up 2 or 3 flights of stairs multiple times during a clean and my quads definitely feel the burn afterwards! Even if your properties don’t have stairs you can do walking lunges intermittently and achieve the same effect. When dusting light fixtures, wiping the high corners of shower walls or my personal favorite, cleaning sliding glass doors, take this opportunity to stretch it out. If you go the extra mile and engage your core any time are reaching you will also give yourself a little ab workout in the process. Don’t forget the elbow grease! Whenever you encounter tough messes just remember the harder you scrub the better the workout for your arms and the cleaner your results! I can’t say how many times squatting is crucial to cleaning. Maybe I’m making things harder than they need to be, but I am constantly squatting to clean shower basins, behind toilets, underneath beds and couches and crouching low to vacuum tight corners. When things seem daunting I take solace in the fact that I am bettering my bottom as well as my bottom line. Cheesy I know but it makes me feel better! Every time I walk into a unit I crank down the AC. I live in Florida I can’t help it. But even so I often work up a sweat. Breaking a sweat is the marker of a good workout. Raise your heart rate and you’re even better off! Also I want to mention that nothing will make you feel lighter on your feet or more motivated than a good playlist. Many times I finish a job and wonder where the time went all because of good music. At the end of the day you get what you put into your job. As an Airbnb cleaner I am blessed with the opportunity to turn my money maker into a calorie breaker! Cleaning is a great workout whether you go above and beyond or not, but if you choose to embrace the workout that comes with your job your body will also thank you. About the Author: Ashley is a professional Airbnb Cleaner located in Seminole, Florida. She is the Co-Owner of Perfect Ten Concierge who wishes she had the stamina to do walking lunges everywhere. To view Ashley’s profile or to book her for your next short term rental cleaning, visit her profile or find an Airbnb cleaner in your area.